DOWN TIME: It proved to be a frustrating weekend for Sheffield Steelers' head coach Paul Thompson and his players. Picture: Dean Woolley. PLAYED FOUR, lost four. Not the most welcome statistic and one that will be burning deep into the minds of Sheffield Steelers’ players and staff as they make their back on the long trip home from South Wales on Sunday night. The main consolation for Steelers from a weekend that brought two defeats and a drop to third in the overall Elite League standings, was that they at least took a point from Sunday’s 3-2 defeat in a shoot-out against leaders Cardiff Devils. But it still goes down as a loss, their fourth in as many league meetings with Andrew Lord’s side and a statistic that needs to be drastically reversed in the second half of the head-to-head league series between the two rivals, the first part of which comes next week, again in South Wales. Another consolation for the Steelers was that, while they were losing 2-1 at Belfast Giants the previous evening, the Devils were getting thumped 8-0 by a supposedly out-of-sorts Nottingham Panthers, who seemingly found their mojo again. It means the Steelers are - effectively - only a point worse off against Cardiff than they were going into the weekend, now sitting 12 points adrift, but with five games in hand. After a goalless first period, Joey Haddad gave Cardiff the lead in the 23rd minute on the powerplay, but the Steelers drew level through Colton Fretter at 31.37. The Steelers were required to come from behind a second time after Patrick Asselin found a way past Ervins Mustukovs at 44.23, this time Mathieu Roy the man levelling exactly three minutes later. That is how it stayed right the way through until the end of an exciting 3-on-3 overtime period when chances came and went at both ends. But Jesse Schultz, John Armstrong and Fretter were denied in the subsequent shoot-out, Asselin coming to his team’s rescue to send the puck past Mustukovs to clinch what could prove to be a precious extra point. On Saturday, Armstrong ruined Jackson Whistle’s hopes of a shutout when he struck with just 72 seconds remaining at the SSE Arena. It was too little too late for the Steelers, who had gone behind early on to a powerplay strike from Colin Shields in the fifth minute. 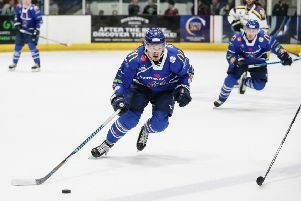 And it was another former Steelers forward - Mike Forney - who doubled the advantage in a tight game, his 44th-minute unassisted strike proving enough to earn the Giants a first win of the season at the third attempt over their rivals, despite Armstrong’s late reply.